are stronger in their love of Allah. A man once asked the sage Bayzid al Bistami, Allah sanctify his soul, to show him the shortest way to reach Allah, to which Bayzid al Bistami replied “Love those who are loved by Allah and make yourself lovable to them so that they may come to love you. Its said that a friend of friend also becomes a friend. Thus who are befriended by God, the saints, the truly enlightened servants of God, the Most High - befriend them. But in order to do that, one must first find them. And even though they are essentially self-effacing and hidden, yet to find them is not something made impossible. For verily there is a not a time in human history that God's earth didn't contain them, no matter how hidden they remain under the cloak of God's Protection from the world. Infact its known in the esoteric circle that the grace which sustain this world will cease when the earth will be barren of such true Friends of God, when the earth will be barren of hearts which intimately and knowingly remember God. When there will be not a single friend of God living on earth, the cosmos will be folded and a new reality will be given birth to. Then this planetary existence, these million galaxies will come to an appointed and pre-destined end, the promised heaven and hell will be brought near and the Judgment Day will be brought in the moment. Human soul will be resurrected and the Lord of Majesty and Glory will begin our final accounting. So until the Judgment Day arrive, the Friends are here among us. And if you do not know the direction to find them, then ask those who know. And its an instruction of God preserved in the Final Testament. In the Surah of al-Anbiya, (the Prophets) Allah says, “then ask those who are people of remembrance (ahl az-zikr) if you do not know.” To emphasize, the same message is repeated again in another place, in 16:43. In the Surah called ash-Shura, which means Consultation ( 42:37) Allah describe the essential quality of the blessed ones as, "Those who hearken to their Lord, and establish regular Prayer; who (conduct) their affairs by mutual consultation; who spend out of what We bestow on them for Sustenance." Thus to consult (not only in worldly affairs, not only for business but for spiritual benefit and guidance), to ask those who are ahl az-zikr, people of remembrance is a path towards illumination - it is partaking in the fragrance of wisdom, beauty and love from those who has wisdom, who embody beauty and who by the grace have perfected their love divine (Amor Divino). To have a place in the heart of the awliya's of the age, to have a place in the heart of true Friends of God are a tremendous blessing. Great awliyas, sages of the past traveled for ages and great distance to find the Qutub, the Spiritual Pole of the Time and became their servant for years after years. Follow the shaikhs, the masters, the teachers of Truth, say the wise, discover their noble qualities, and, perhaps, thanks to their blessings, you will one day attain happiness. 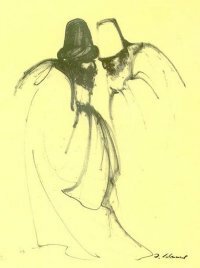 Sufis say, too, that the seeker must strive to win the love of the shaikh’s heart, because the hearts of shaikhs are the source of divine wisdom, and the murid, through the required diligence, sincerity, and loyalty to his teacher, will be enabled to acquire his share of this and, as a result, be honored with the blessedness of their mystical states. To give an example, the great master Yusuf al-Hamadani, may Allah sanctify his Sirr, who was the teacher of Abdul Khaliq Gizhduvani, the founder and great mysticsaint of Central Asian School of Sufi Mysticism - he served two hundred thirteen shaikhs in his time, sometime carrying their goods, serving their food or simply being attentive in their presence. When Jesus appeared on the land, most people remain oblivious but those with heart knowledge, came from far and away to visit him, to receive his blessings. Even the three wise men came from far east to receive the blessing of his presence and perhaps to initiate the baby Jesus with esoteric blessings. While in his mission, not everyone was interested in him. But those who had devotion and love in their heart, they hastened to see him, to hear his words of wisdom and to receive his glance. The teachers of truth are heirs of the Prophets and Messengers. The Sufi Shaykhs are the heir of Prophet Muhammad, may Allah shower blessings on him and to find them, to be near them and sit in their circle of teaching is comparable to the role you could have had you were born in the time of the Prophets. Understand this wisdom. What happened in the past, is still happening within us. As it is in the horizontal time, so it is in vertical time within. The reality of human existence is such that no matter in what form, age and circumstances we are born and live, we are tested never the less for our sincerity, devotion, love and willingness to sacrifice for truth. If someone in his or her present life time doesn't feel the thirst to find such true human beings today, to be near them and to receive blessings from them - it can be safely said that such person, had they were born in the time of Krishna, Christ or Muhammad would display the same oblivious attitude as well and would remain blind in the same fashion as they are towards the successors of those great souls. as well as your staying. Hearts of the teachers of truth, hearts of God realized human beings are like rose garden. And such gardens exist in the world in present time as it did in the ancient time. Rumi says it best when he said, "If you go to the garden of the Heart, you'll have beautiful perfume like a rose." 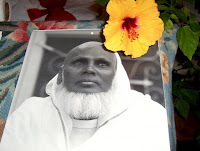 The perfume is best obtained, not from reading of past accounts from dead pages but being in real garden with alive flowers and flowing life-giving breeze - that is by being near the presence of the awliya, the saints of the time and by being under their gaze and love. and you will become love's beggar. and we will bring you back to life.